Here’s an excerpt from the introduction of my work-in-progress, a book on developing and maintaining a daily spiritual practice. I’d love to hear your feedback in the comments, below. Thanks! 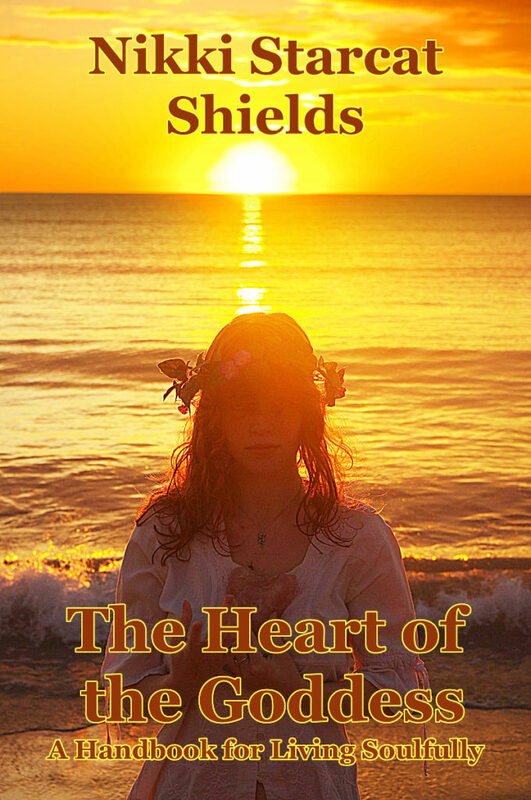 You’ve felt it: the longing for a deeper meaning to your life. The search for spiritual connection. The yearning for more of those moments of lucid clarity, uplifting joy, and freewheeling bliss. You know, deep down, that feeling whole is your birthright. In your own unique way, you are a seeker. Traditional religions and their rituals no longer speak to as many people as they once did. 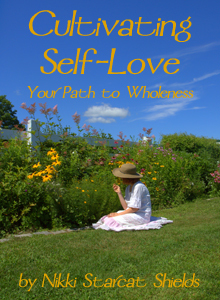 Instead, many of us choose to look within to find our own personal spirituality. A connection to the Divine, or to nature, or to that which you hold sacred, is an individual relationship. You don’t need a translator or a go-between. You’d rather develop your own intimate relationship with the energy of the universe. Or maybe you’re uncertain just what your beliefs are, and want to explore them at your own pace, free from dogma and doctrine. 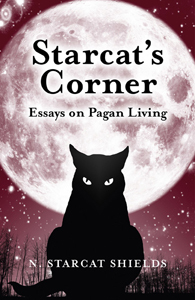 You long to create your own tradition, drawing from many sources, ancient and modern, to craft an eclectic personal spirituality that speaks directly to your experience. When you begin to explore your personal spirituality, the first step is often to do a lot of reading. Chances are, when you open a book categorized as self-help or personal development, you’ll soon find a page with exercises to complete or questions to answer. With a groan, you may read that section and then go on to the next chapter, or stop and put a bookmark at that page, thinking you’ll get to it later. The books may accumulate on your shelf, waiting for that “sometime later,” when you have more time to focus on them. Many people say that they want to include more spirituality in their lives, but they can’t seem to find a way to fit it in. Yet ultimately, reading about spirituality isn’t the same as practicing it. Why would you want to have a spiritual practice at all? Isn’t just living life itself a spiritual practice? Of course it is. Yet when you set out on the path to be more consciously aware of your spiritual connection, it can seem overwhelming. You are, in essence, choosing to become enlightened. Despite popular notions, enlightenment isn’t a fixed point that you arrive at one day. It doesn’t mean that you figure this puzzle of life out once and for all, and everything will be bliss and roses from then on out. It’s not a lofty state that only the great mystics can achieve. Enlightenment, to me, means cultivating the awareness that you can choose to live in harmony and joy, to go with the flow of life. Sure, you won’t be joyful in each moment, but you’ll develop the tools with which to return, again and again, to your center, to connection with the energy of the cosmos. 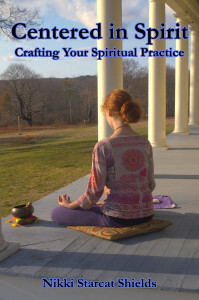 Creating a spiritual practice can provide you with those tools. When speaking of enlightenment, many cultures have used the analogy of climbing a mountain. You will find your own path, and the climb will be beautiful and enriching, but it won’t always be easy. In your daily life you will encounter challenging situations, people, or events that can negatively impact you, not only in that moment, but potentially for much longer. A daily spiritual practice allows you to reset your connection with your inner self and see the world in a more hopeful light. In addition, as you practice connecting yourself to your higher purpose, you will not only interact with your life differently, but you’ll be able to change it in ways that feel great to you while living in harmony with others in your life. The benefits of starting and maintaining a daily spiritual practice are wide-ranging. After you’ve established a practice and nurtured it for a while, you’ll gain a better knowledge of who you are (and who you are becoming), a stronger connection with the world around you and its other beings, and a visceral knowledge of your own divinity. Not only do you develop your personal connection to the universe and the Divine, but you also continue to expand and grow into a more well-rounded and loving person. Being grounded in a spiritual practice will also have a positive impact on your physical health. You’ll experience less stress, and your emotional life will become more joyful and peaceful. As a result, your relationships will improve, including the most important relationship you have: the one with yourself. You’ve heard it many times: practice makes perfect. If the word “practice” and the associated concepts seem hard to accept, you’re not alone. I was one of those people who never understood the importance of practice until I was an adult. As a bookish child, my natural aptitude for academics made me not trust anything I couldn’t do on the first try. As a result, there were many things I might have enjoyed that I crossed off my list because I “wasn’t good at” them. It wasn’t until after college that I realized the real value of dedicating oneself to a practice. To become proficient at anything, you need to practice regularly. It’s as simple as that. This is just as true for spirituality as it is for playing sports or mastering a musical instrument. Living spiritually, as with any new skill, requires regular practice. Just attending a church, circle, or temple, or reading books about values you want to embody, isn’t enough. You need to engage in active involvement of some kind, not just passive attendance. In order to become what you wish, to live your deepest truths, you must take action. And to be able to act with any skill and grace, you need to practice on a regular basis. Living your spirituality also takes discipline, another word that can sound scary. To those of us drawn to a life of the spirit, the idea of discipline can be a turn-off. We’re free spirits, wanting to soar, and discipline sounds like a set of chains to hold us down. However, self-discipline can instead serve as a helpful container for your spiritual exploration. When you choose to commit yourself to a particular practice, for a set amount of time each day, with your full attention, magic happens. Your spiritual practice, done consistently, even if it’s just ten minutes in the morning or before bed at night, will have a ripple effect that spreads outward into your entire life. That seemingly-small container of connection that you create each day will allow you to grow, expand, and flourish. Like the Doctor’s famous Tardis, it’s bigger on the inside. But wait just a moment, you might be thinking. Daily practice and self-discipline? That sounds like a lot of extra work. You already have a full schedule: a day job, partner, kids, a social life, household duties, and other responsibilities. How can you afford to take the time to create your own meaningful spiritual practice? The cool thing is, you can easily create a daily spiritual practice that not only fits into your existing schedule, but also brings joy and depth to your life. You can learn to commit to your practice, no matter what else is going on in your inner and outer worlds. You’ll soon find that you can’t imagine what you used to do before your dedication to practice. I know this from my own experience. I’ve had a daily spiritual practice since 1997. My two kids were born in 1996 and 1999, and I was the primary breadwinner for our family. For several years leading up to when I started my practice, I had read many books on spirituality, with their suggestions of how to implement the tools they were offering. I started several practices that lasted a few days or even a couple of weeks, but went no further. It wasn’t just that I was busy (which I certainly was), but some old patterns also played into my initial reticence. Spiritual practice is a form of self-care, and many of us, especially women, feel a certain guilt about taking time for ourselves. We are taught to give, and taking time and energy for our personal desires can feel uncomfortable. Often, we are also afraid of our own power and potential, and of taking responsibility for our choices. By actually taking the time to walk my talk, I knew I was embarking on a journey that would require me to be more honest with myself, and true to my deepest desires. That was a scary step to take. Do any of these fears resonate with you? It was my desire to learn to do Tarot readings, combined with a life-long love of writing, that helped me to finally create the perfect practice for me, one that has lasted for many years. Before long, I realized how much the other people in my life were benefiting from my daily dedication to spiritual practice. Supported by that daily container of conscious centering, I was able to be a better mother, wife, employee, and friend. I was calmer, and could find the space to respond genuinely and more mindfully to life’s challenges. My morning practice became part of our family’s routine. Sometimes the kids would sit with me and look at my Tarot cards. My husband made space for my practice, helping by packing my lunch or distracting the kids. When we went on vacation, usually family camping trips, we’d all sit on the grass and meditate together. I learned to listen to the chattering of the kids without distraction, allowing it to be part of the landscape, like the singing of birds and the sigh of the wind. Now my children are nearly grown, I work for myself, and my practice has evolved with me. In fact, my spiritual practices have expanded over time and become part of the fabric of my everyday experiences, informing how I approach my work, household chores, and playtime. You, too, can find the satisfaction of a practice that fits into your life and becomes an intrinsic part of your daily routine. 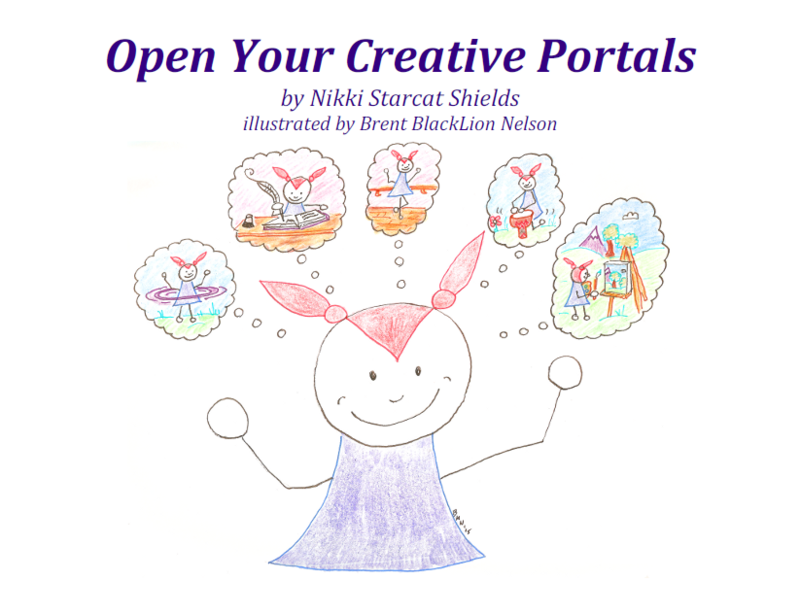 I’m delighted to announce that Open Your Creative Portals is now available! This was a key goal for me this time around, and in fact it’s taken since April, when I had the idea originally, to complete it. So I’m very psyched! “Ask any artist, and they’ll tell you that they do their best work when they approach it with a relaxed, joyful, receptive attitude. When you’re being too serious about your work, the pressure is on. You’re trying to DO IT RIGHT, which is sure to scare away your creative connection. When you’re antsy or thinking about all the other things you have to do (i.e. not being in the moment), your work suffers. 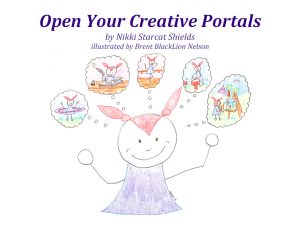 “When you bring a sense of playfulness and fun to your creative work, that’s when you tap into the flow of energy. Creativity comes to play, to dance, to WHOOSH right through you and onto the page, the canvas, the knitting project. You know this, you’ve felt it. In other updates for this week, I have a lot of projects in the works, though nothing else completed at the moment. I am making good progress, though. I did order copies of my first book, and they’ll be here in time for my event next weekend, so that’s good news.